This has gotten out of control. Everywhere you look, there's it is. Comic Sans. 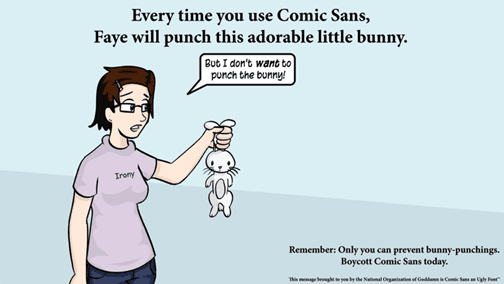 There's a website (there's always a website) that aims to ban Comic Sans. That horribly boring little font that makes everything look like it's supposed to live in the comics section of the newspaper (remember those from back when you read the "paper" and not the 'news"?). Anyway, the site ban comic sans has made it their mission to rid the world of this font, since it's so overused - even in the business world. I dare you to walk around your office building today and not find a single use of Comic Sans on a sign, bulletin board, newsletter... maybe it's even on your INTRANET! If you don't believe it, or if you haven't noticed, check your pulse watch the video below. It's long (8 minutes) but it's quite funny. Especially when they use Comic Sans to make over some of the most prominent logos of our time: FedEx, McDonald's. That's when you really see just how much of a travesty it is to use Comic Sans. Let's work together to make sure that Comic Sans stays in its place: in the comic books. For more font fun, also see my earlier post: What if fonts were people?"